← How Lucky Can One Girl Be? This entry was posted in Uncategorized and tagged Birthday Month, pasta, salad, Weight Watchers, WIAW. Bookmark the permalink. Thanks! 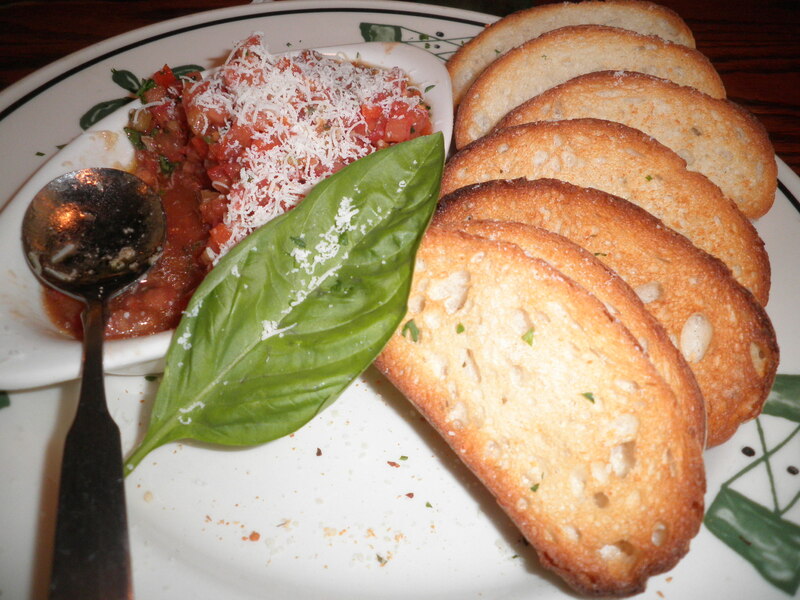 I really think the next time I go, bruschetta will be my entree! Happy Birthday! Hey you only live once, right? Enjoying special days with fun and delicious food is AWESOME! Thanks, Natasha! I completely agree!! Thanks for stopping by, please visit again! When its your anniversary you have to be able to have a little fun. I think indulging a little bit can reinvigorate weight loss efforts as you want to eat healthier afterwards. Happy WIAW! Thanks Ffion! great way to look at it! Thanks for visiting, please stop by again! what a fun outing to celebrate your anniversary, fran! 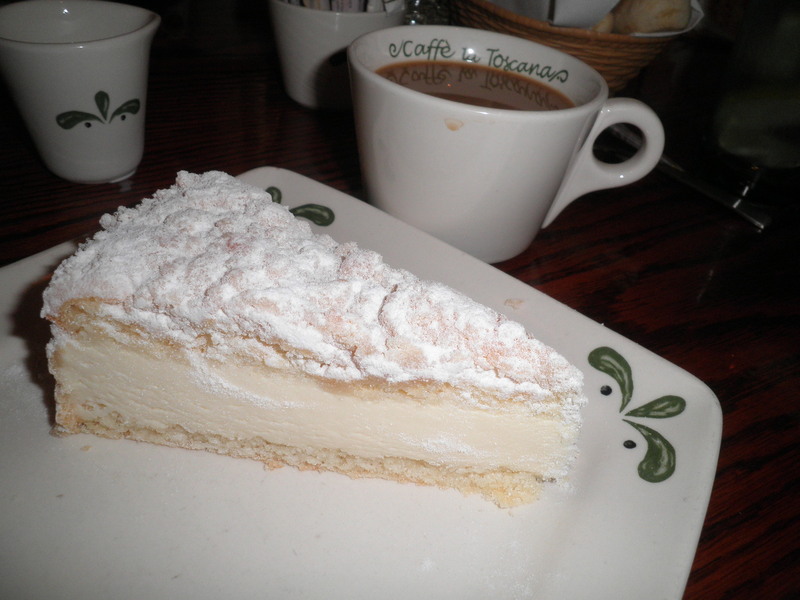 it has got to be 20+ years since i’ve been to olive garden…it was the “hot spot” back in the early 90s! i am glad you are balancing celebrations with ww…for ‘falling into good habits,’ we NEED to include celebrations! special treats are a good habit! and happy birthday MONTH!!! Thanks, Cathy! I do try to balance my good habits with celebrations. I have to be strict this week because this weekend is birthday and I know I’ll be indulging somewhat…at least in my yummy birthday cake that Ele is making for me!! Hey, you had to celebrate! And there is no shame in the Olive Garden. We don’t have one in Charlottesville, and we never went out to eat growing up, so I actually think I’ve only been in one once. However, since I would pretty much go to eat at Whole Foods every meal of my life (not that glamorous), I say…eat what you like. And a gift card? Obviously. I alsohate paying for salads, but I’m glad you enjoyed it. And I wish I could handle cream better (and that it wasn’t Vegan MoFo) because that cake looks out of this world! Oh, my gosh, Sarah…that cake is incredible! A few years ago I thought about asking for that as my birthday cake. But at the time it was $35 and I’m sure it’s more now! 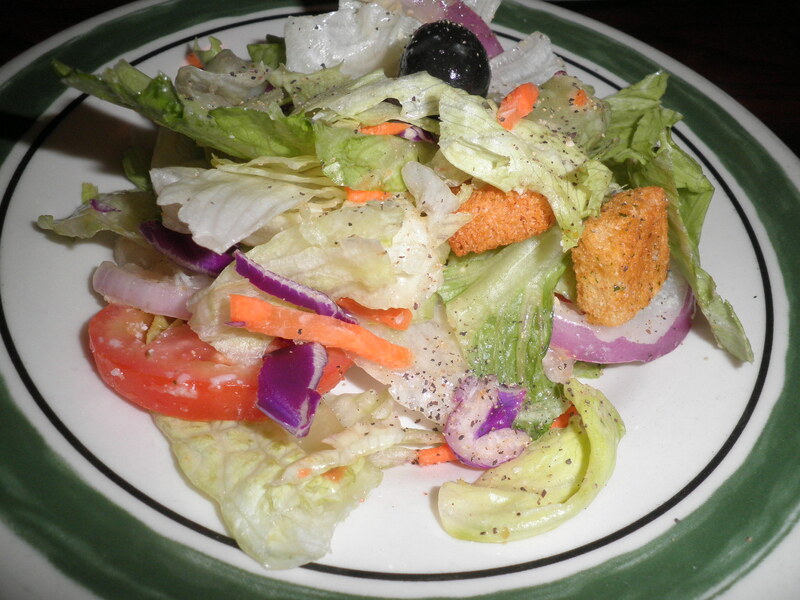 Too funny- I scrolled halfway down the page by accident and saw that picture of your salad and was like, “That looks like it’s from Olive Garden.” Yup. I was right. Amazing the stupid little things we remember…. Now I just gotta use that noggin for midterms! 🙂 Happy Anniversary. Thanks! Isn’t it funny the things that stick in our minds?! Good luck wit mid terms! Thanks, Tessa! It was a terrific way to celebrate, not the worst food choices I’ve ever made 😉 AND we had gift cards! Winning situation all around! Have a great day! Congratulations, and happy early birthday!!! I’m living in Toronto right now but every time I visit my family in Florida I make a point of going to OG with them – their bruschetta is to DIE for, I agree!!! I had no idea they even made those cakes, I do love me some salad from OG! Hi Courtney! Oh…the cake is just amazing. I’m a real lemon flavor freak and this is incredible!! Thanks for stopping by! Mhm, that cake looks good! What a great way to end a nice meal. Thanks, Shannon! Ralph’s a great guy and I’m very lucky! The cake is yummy!! Allie, they were both very yummy. I figure for what they charge me for a salad and pasta…I can eat for a week! I agree with you about their desserts being spot on – yum! Happy anniversary!!!! Hi! Ralph the chocolate raspberry cheesecake and I tasted it. It was tasty, but my lemon cake is better! Happy Anniversairy to you and Ralph! I do think it’s a healthy habit not to worry about what you eat on a special day. We all do it way too often in everyday life and celebrations are to be enjoyed to the fullest. Hi Suenne! Thanks for stopping by and I’m glad you like BCDC. It came out of a lecture I was giving one night when I was a Weight Watchers leader. I always remembered it and said I would use it for a book title. I still may! I agree, we all need to be a little flexible on those special days! Please visit again! 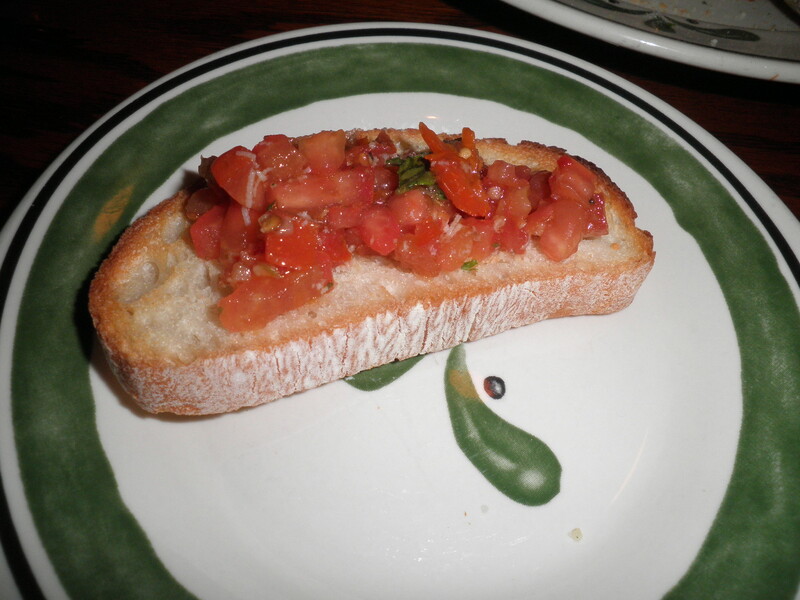 I love bruschetta…looks like a really yummy anniversary meal. Glad you enjoyed it! Thanks, Zo…it really was nice! 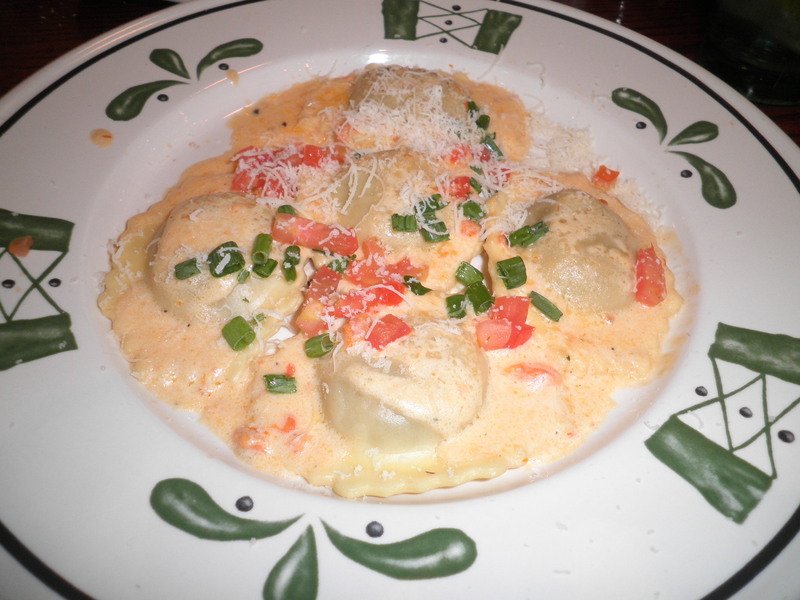 Olive garden is alway so busy at night and weekends, that’s why we did lunch!